A coffee table with your own hands, the drawings of which will simplify the process of its manufacture for you, in fact, is not difficult to construct. Today, perhaps, no modern living room can do without a piece of furniture. 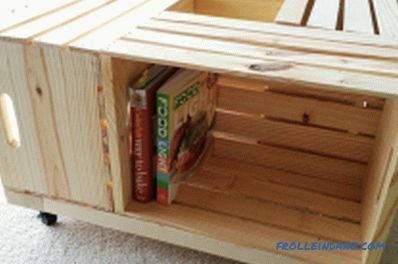 The coffee table can be easily made with your own hands, while saving a fairly large amount of money. Many use it as a place where magazines and remotes from various devices are stored, some use a romantic lunch or dinner, and others prefer to use it simply to decorate the interior. To complete the image of a coffee table, vases of flowers or beautiful napkins are often placed on it. Coffee tables are used both to complement the completeness of the interior, and to give it individuality. Such furniture is universal. Coffee tables can be found in the cottage, and in a small apartment. If you decide to make a table with your own hands, do not be afraid and do not despair. 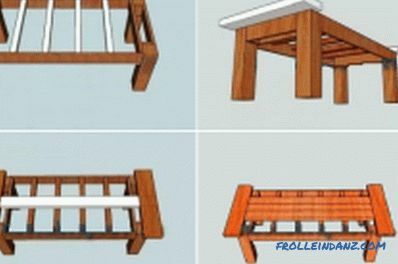 Assembly steps for a typical coffee table. Therefore, before you start making a coffee table with your own hands using a drawing, you must determine for what purpose it will be used . 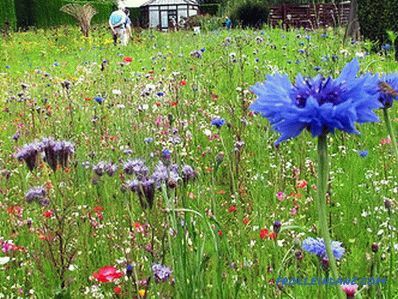 From this will hang and its design, and size, and the material from which it will be made, and color design. The drawing can be easily executed by yourself. A coffee table made of wood is considered one of the most popular. Such a model is distinguished by stability and a certain validity. The table will be made much easier and faster if you make a drawing of it, at least schematic, before starting work. 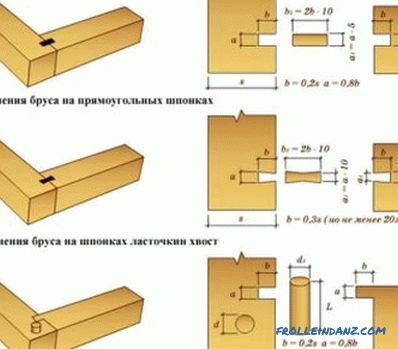 So, the drawing will help to avoid possible mistakes, and also you decide what parts and in what quantity you need to purchase in the shop for making the table with your own hands. To make a coffee table, you need to find beautiful and high-quality wooden bars that do not have any knots or cracks. They can be cut and fit to size right at home or in the store. All elements of the future coffee table must be carefully cleaned. During work, be careful not to deviate from the planned drawing of your future design. Final layout of the coffee table. From wooden bars having a length of 42 and 52 cm and a cross section of 10 * 10 cm and 2.5 * 10 cm, we make two designs on the sides. 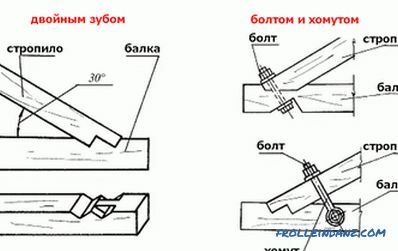 They can be connected using wood glue and screws. Coffee tables should be perfectly level. 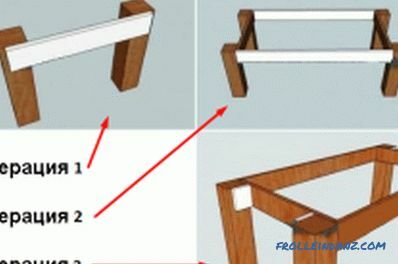 Make sure that the location of the fastened elements was at right angles. Before screwing in the screws, drill small holes in the places where they will be placed. Use for this drill with a smaller diameter than the diameter of the screws. Then screw in the screws, trying to "drown" their caps as far as possible in the wood. 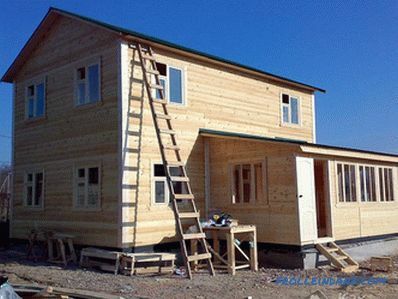 Make sure that the screws on all sides of the structure are at the same level. Next, using a bar with a cross section of 2.5 * 10 cm, we combine these two structures into one. Strictly monitor compliance with the right angle. Then we attach two more bars on each side, having a cross section of 2.5 * 10 cm. They will be needed for a kind of table skirt. This is the end of the first stage of making a coffee table with your own hands - the creation of its frame. Now it’s worth checking the correctness of the connections. We check our drawings and the table itself diagonally. Both diagonals must have the same length. After we made sure that no adjustments are required, we deal with the sides of the table. We take two bars with a cross section of 2.5 * 10 cm and close the side ends with them. Now go to the tabletop. We make on the frame a solid foundation for it. To do this, take 4 bars with a cross section of 5 * 5 cm and fix them. Make sure that the bars are at the same distance from each other. Now our frame has become tough and durable. Check the drawings and deal with the table top itself. 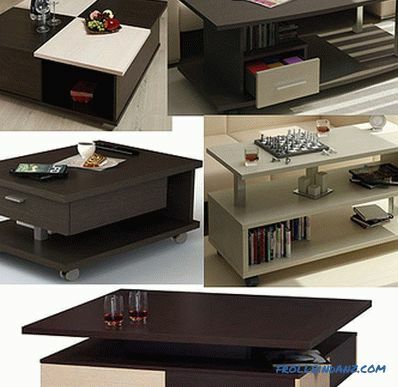 The original coffee table can be made of ordinary wooden boxes. At the edges of the table at an equidistant distance from the edge, we fix two bars with a cross section of 5 * 15 cm. Adjust the length of the main bars, from which the worktop will be made, to this distance. Before you set the planks for the tabletop, you should certainly polish them. The first level you must fasten strictly in the center of the table. Arrange the remaining bars in turn from two sides.They can be planted on carpenter's glue or screwed with screws and self-tapping screws. Make sure that they are tightly pressed together. Otherwise, a couple of days in your tabletop may form unpleasant gaps. In this way, lay the entire countertop. Coffee tables with such a table top look the most impressive. we leave it in this condition for a day. Now your new coffee table, which you made with your own hands using a drawing, is ready. self-tapping screws having a length of at least 70 mm. You can set the table at the right place and invite guests to rate your work. Perhaps they will follow your example by making their own coffee tables.